Growing up, I would always skip over the Waldorf salad at church salad suppers. I didn’t like the look of whatever was in the dressing that, in my opinion, ruined the perfectly good apple pieces. Since then, I’ve expanded my tastes and have decided that Waldorf salad isn’t all that bad. One concern that people have with it is the healthiness; the dressing is made up primarily of mayonnaise, which packs on some extra calories and fat. One way to avoid that while still making a delicious salad is by substituting Greek yogurt for the mayonnaise. We’ve been hearing for months, if not years, about the health benefits of Greek yogurt. Search “Greek yogurt” on Pinterest and you’re bound to find hundreds of snack ideas and recipe substitutions that use Greek yogurt instead of other foods that pack on the calories, cholesterol or what have you. 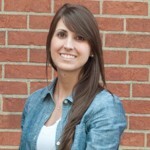 Michigan State University Extension breaks down the hype surrounding Greek yogurt. Plain, non-fat Greek yogurt is a great choice to cut down on the added sugars that some flavored yogurts contain. Greek yogurt has more protein than regular yogurt, and it has about half of the carbohydrates of regular yogurt. This Waldorf salad with Greek yogurt recipe was inspired by one I found on A Latte Food that substituted Greek yogurt for mayonnaise. I tweaked the recipe a bit, referencing a classic Waldorf salad recipe in one of my cookbooks, as well as a peanut butter Waldorf salad recipe in my church’s last cookbook edition (where was this one at all of those salad suppers?!). I also based my ingredient choices on what I had on hand: pecans leftover from holiday baking, apples, raisins and celery. There isn’t just one way to make a Waldorf salad. Some recipes call for chicken or turkey. Others use grapes. 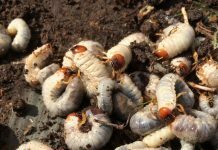 I’ve seen them with lettuce, cherries and walnuts, too. So change up the ingredients as you wish. The goal of this recipe is to create a healthy dish; otherwise, I would have tossed in some marshmallows for fun and added sweetness. When I think of Greek yogurt, I think of honey. Honey is a simple way to sweeten up plain Greek yogurt. And when I think of apples, I think cinnamon, so that worked as a way to add some flavor to the dressing, too. Lemon juice is one ingredient found in the classic dressing recipe, so I kept it to add some flavor. Plus, lemon juice can be used to keep apple slices from browning. 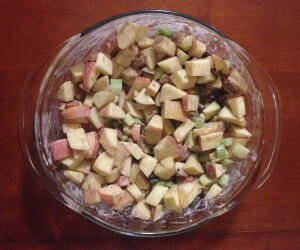 So, I kept the basic Waldorf salad ingredients: apples, celery, raisins, pecans and lemon juice. Along with the Greek yogurt, I added sugar, honey and cinnamon. It’s a bit of a different taste than the traditional salad, and this recipe may be heavier on the apples than others, but it’s delicious nonetheless. Dice 3 medium-sized apples. 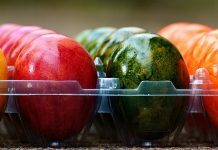 I used Fuji, but you can use Red Delicious, Honeycrisp or another variety. Dice 2 to 3 celery sticks. Dice pecans; they don’t have to be in even pieces. 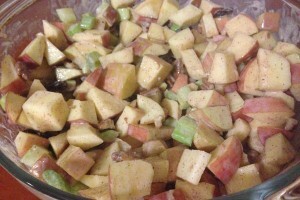 Add apples, celery, pecans and raisins to a large bowl. You can mix up these ingredients with your hands or with a wooden spoon. You’ll make the salad dressing in a separate, small bowl. Open up an individual-sized container of plain non-fat Greek yogurt (or a larger container if that’s what you have). Scoop out enough to fill ¼-cup. Add 1 teaspoon lemon juice, 1 teaspoon sugar and 1 teaspoon honey to start. Mix up these ingredients with a rubber spatula. Try the dressing to determine if you want to add more sugar and honey, or if you want to add cinnamon. I added another teaspoon of honey at this point, as well as half a teaspoon of cinnamon. Once the dressing is mixed well and suits your tastes, pour it over the fruit and pecans. Mix well with a rubber spatula until all ingredients are coated with the dressing. Cover the bowl and keep refrigerated until you’re ready to serve it. This recipe should make at least 6 to 8 servings, depending on serving size. 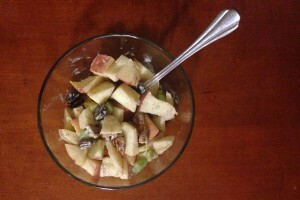 Combine diced apples, celery, pecans and raisins in a large bowl. Mix gently with hands or use a wooden spoon. Combine yogurt, lemon juice, sugar, honey and cinnamon in a small bowl. Mix with a rubber spatula. Pour dressing over fruit and nuts. Blend well with spatula so all ingredients are coated with dressing. If you make this recipe, or have any suggestions for other ingredient substitutions, let us know in the comments below! looking at Waldorf Salad with Greek Yogurt & can not find in the recipe’s directions where the Greek Yogurt is/or mixed in????? The Greek yogurt is mixed in with the lemon juice, honey, sugar and cinnamon. I apologize for the error in the directions. 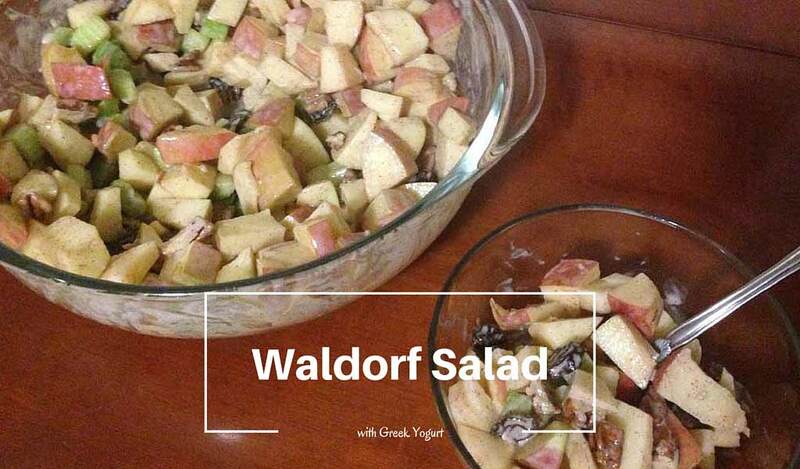 How long after preparing the Waldorf salad using yogurt can it keep refrigerated? Or would it have to be consumed the same day?